Note: this post was edited on Dec. 13, 2010 to add a few new pictures. 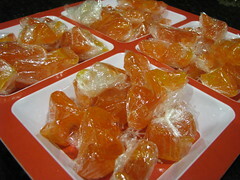 Today we did a lot of candy and sweets making (it’s for gifts…shhhhhh). 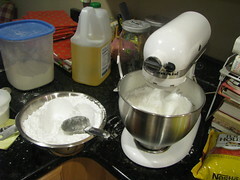 We started by making our own marshmallow fluff, which we later used in a cooked fudge. 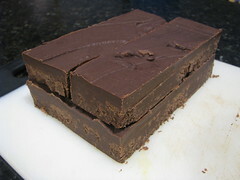 Post updated with picture of finished fudge. Fluff is just egg white, powered sugar and corn syrup–so simple it really doesn’t make sense to buy it pre-made. 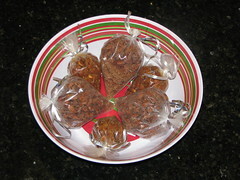 We had a surplus of almonds at hand, so we made spicy and candied varieties. 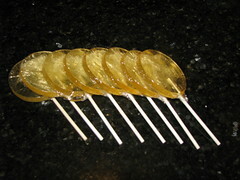 We made some hard candies, including lollipops and ribbon candy. 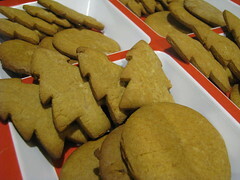 We used some of our home-raised honey in honey spice cookies. We’ll ice and decorate these tomorrow. 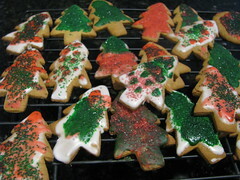 Post updated with pictures of finished cookies. 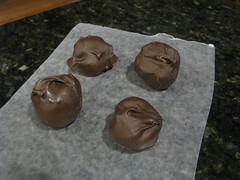 Our last set of treats was coconut bon bons (think mounds or almond joy, but yummier) and chocolate covered cherries (with our homemade maraschino cherries). 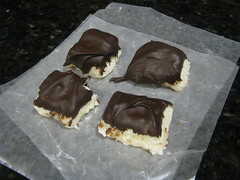 For the bon bons we adjusted the recipe by doubling the amount of coconut. Next time we do this we might try substituting cream of coconut for the sweetened condensed milk. For the cherry recipe, we doubled everything but the cherries (it just needed more to fill and cover). 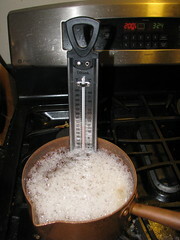 Working with melted chocolate can be a challenge, especially when making larger batches. We don’t do anything fancy, we just melt morsels in the microwave. However, we use an Alton Brown suggestion and keep the bowl on a heating pad to keep the chocolate hot enough to work with but not risk burning. Works great. Sorry no pictures of these, by this point we’d been making sweets all day (unbelievably, even the children were reaching sugar saturation). I’ve updated this post with pictures of the finished product. A note about recipes, etc… We have tons of recipe and holiday books. We like to use them to get ideas of what to make, then we search the internet for the best recipes (usually just picking the top item in the Google search results). We like referring to the online versions where people have commented about dos and don’ts so we avoid the dreaded “Martha Stewart” recipe that literally doesn’t work or has never been tested. Your recipes sound lovely. Your fudge looks wonderful and those almonds look amazing! Thanks, it was our most successful fudge ever. 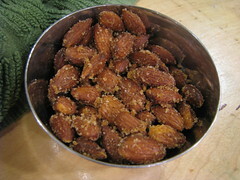 THe almonds were divine, it smelled SOOO good in our house. We will be making another batch of them this weekend, they are just too good!